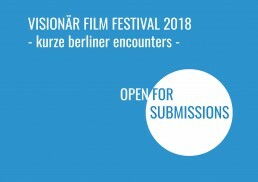 Visionär Film Festival 2018: submissions for short movies are now open! We have big news for Visionär 2018! Next year, in addition to the full-length feature films from around the world, short films by Berlin filmmakers will complement the festival programme. With the section Visionär – Kurze Berliner Encounters we want to support the first steps of the Berlin filmmakers who are creating their first work. We are interested in showing the process of how young auteurs approach feature film, through free experimentation with the short format and new ideas. With this brand-new section, we want to strengthen the local scene and to enforce the vision of the city as a vibrant cultural center, in which artists from different disciplines come together. Visionär – Kurze Berliner Encounters offers young Berlin filmmakers the chance to show their works to audiences on a big screen and to interact with other young creators. The submissions for short films are now open! Please send a screener, a short bio, a synopsis and technical information to us at: info@visionaerfilmfestival.com. Looking forward to receiving your short film!